Shabbychick Junk. : Our Craft Lounge - Running Sick! Well if there was ever a more perfect day to post this exciting news, I don't know when it would be! I held down the couch cushions last night with a full-blown sinus infection! Can you believe my assignment was to post this "Running Sick" set, to announce a BRAND SPANKIN NEW STAMP COMPANY called OUR CRAFT LOUNGE!??? They will be up and RUNNING for business this Friday, November 14th, with a TON of cute stamp sets for you to browse! Here's a sneak peek of one of the new sets, called "Running Sick"! Check it out, have you ever seen a more appropriate cold-and-flu-season set? LOL! 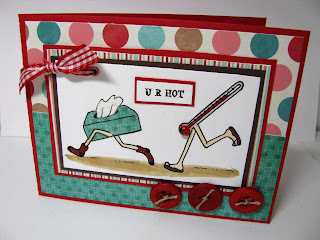 This card uses both the running kleenex box and the thermometer..when I made it I was picturing a hubby and wife sitting home in their p.j.s because the kids gave them the latest illness-du-jour! I used a clear dew-drop type bauble (Darice luster gems) and colored it in red for the bulb on the thermometer! I had visions of green, snotty baubles on this card, but since the samples will be used on the Our Craft Lounge website, I restrained myself. Instead there are subtle green tones and green buttons to give the card a GREEN feel!!!! LOL! Our Craft Lounge opens on Friday, so I'll provide links and a reveal later on for you to check it all out! In the meantime, check out these other blogs for more sneak peeks! ACK - I love it! So clever, LZ! I love the action! Sorry about your sinus infection! ICK! You are SOOO GOOOOOOOOOOOD, girl! OMG!! Sold!! I love them...I love the sentiment GOt the Runs!! Who would I send that too....ANYONE!! Bwaahaahaa!! Great job!! I cannot wait til Friday! YOU ROCK! !I love all that you do!! 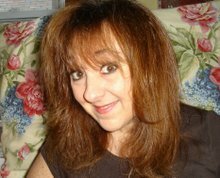 OMG Lisa@@ These are Priceless!!!!!!!! These are too stinkin' CUTE!! :) Make me smile!! OMG!!!!! LZ, you are such a rockstar. I loooooooooooove these cards! You are amazing with snot. LOL! That set is tooo funny!! Thanks sooo much! Zappy!!! I showed these to Gav and he is LOL!! Love these! oh and I meant to say...green snot baubles!!! LOVE IT! 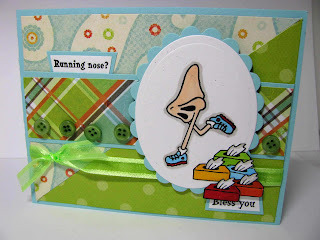 I LOVE your snotty cards! these are too funny! you did a great job not feeling so hot! Perfect! These are perfect, LZ! Now please get better quickly so you can enjoy everything again! Cyber-chicken soup on the way! LOL!! You ROCK my friend, LOL!!! Oh Zappy....these card are so flippin CUTE! 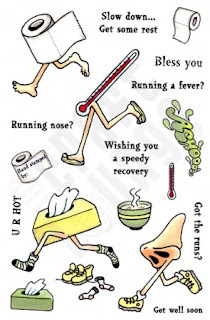 Love the running kleenex and thermometer card. It had me laughing out loud. BTW....I would not have been offended by green dew drops....just so you know you have friends in low places. LOVE YA!